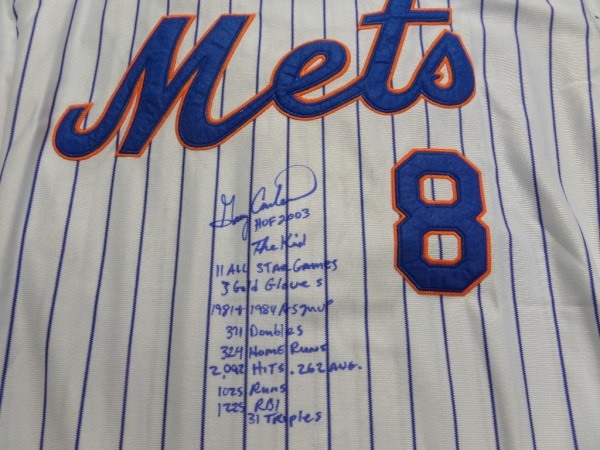 Coach's Corner - Gary Carter hand signed/guaranteed Mets "Stats" jersey. Go Back to Lot List Gary Carter hand signed/guaranteed Mets "Stats" jersey. This hi-quality home white pinstripe is trimmed in blue and orange team colors, has sewn on everything, and even has the 1986 World Series patch intact. It comes blue sharpie, front side signed by the late HOF catcher we knew as the "Kid", and with all kinds of career stats written as a bonus. It is a 10 all day long, and even has our famous lifetime guarantee attached.